Ramiro Herrera stands with his wife San Juanita at their home in Brownsville. Ramiro Herrera, a young-looking 72, evidently is in top physical condition. Two weeks ago the Brownsville resident accomplished part of a lifetime dream by ascending to the base camp of Mount Everest, a 90-mile round trip, high-altitude journey that has defeated many people much younger than him. Herrera said the base camp guides were astonished at how easily he accomplished the trek. “The director of the company (that escorts trekkers from Lukla, Nepal, to the base camp, elevation 17,598 feet) was surprised how I did — like a young person,” Herrera said last week as he recounted the journey. The base camp is the place in the Himalayas where ascents to the summit of Mount Everest, elevation 29,929 feet and the world’s highest mountain, are organized. Herrera said he had a hard time convincing one of the Nepalese companies that operate Everest base camp treks to take him there. The reason was age and a lack of climbing experience, he said. In the end, Amigo Treks and Expedition Pvt. Ltd. agreed to take him to the base camp based on his healthy lifestyle and a lifetime spent running in competitive events, his wife San Juanita Herrera said. He also has never smoked and doesn’t drink. Herrera has run competitively since age 10, when he lived in Mexico, even qualifying for nationals, currently runs eight to 10 miles a day and has run in 56 marathons in various parts of the United States. He completed the 90-mile trip to the base camp and back entirely on foot, according to a news release from Amigo Treks. “It’s what I like. I like to run,” he said, speculating that all the running conditioned him to be able to tolerate the altitude. Many trekkers succumb to altitude sickness and headaches because of the shortage of oxygen that high in the Himalayas. Herrera planted a U.S. and a Mexican flag in the snow at the base camp. He said Amigo Treks promised to take him to the summit next year, a dangerous and expensive proposition. Because of the weather, two time slots are available, March to May and September to December. The cost ranges from $45,000 to $150,000. Herrera has his sights set on completing the climb. He said he plans to become “the first Mexican-American from Brownsville, Texas” to reach the summit. He added that there are five stations on the climb, the last of which is known as the “death zone” because so many people die trying to climb Mount Everest. According to Wikipedia more than 290 people have died trying to climb the mountain. 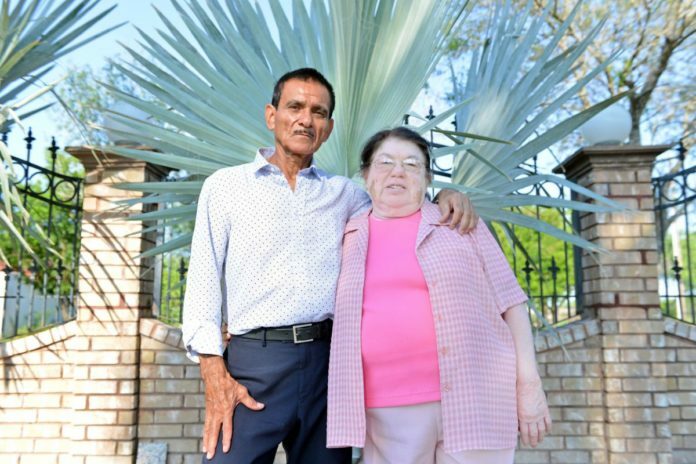 Herrera and his wife returned to Brownsville to live after he retired from the General Electric plant in Chicago after 35 years of service. He ran in the Chicago Marathon for 32 straight years, the Las Vegas Marathon 10 times, the Boston Marathon, and marathons in Hawaii, Alabama, Ohio and Georgia. GE has sponsored Herrera in many of his marathons, although not the Chicago Marathon, and he said he will ask the company to sponsor his climb to the top of Mount Everest. If not he plans to fundraise for the trip himself. San Juanita is justifiably proud of her husband, as are their two sons and grandchildren. The oldest son has pledged $5,000 to the fundraising effort. Later on, Herrera said he wants to go to the schools to talk to the kids about the benefits of healthy living and to urge them to not drink or smoke.